Women’s Health Specialists, PA, the office of Dr. Thomas McDonald, Dr. Frank LaBarbera, and Heidi Little, PA-C, has been practicing OB/GYN services in the Roanoke Valley since November 2000. WHS, located at 1381 Medical Center Drive in Roanoke Rapids, offers complete and total health care for women of any age. 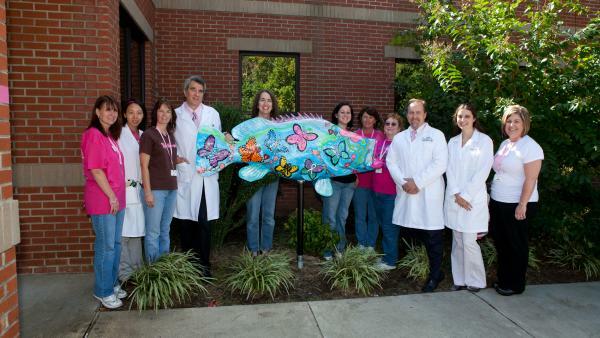 The WHS Rockfish, designed by local artist Sarah Deese-Davis of Roanoke Rapids, was created to celebrate life, hope and strength after cancer, especially breast cancer, with its butterfly and ribbon design. Do your part! Schedule your yearly examination with Women’s Health Specialists by calling their office.